Do all planets orbit the equator of their star? It was once thought that all planets would orbit around the equatorial plane of their star, or at least very close to it. However, as with a majority of exoplanet discoveries, the theorists were sent back to the drawing board. 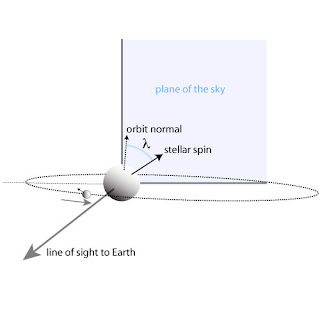 The angle of a planets orbit relative to the rotation of its host star is called the spin-orbit alignment. This is not an easy thing to measure for a large majority of exoplanets, as it requires high precission measurment of v sin I, which can only be done for small inclinations. 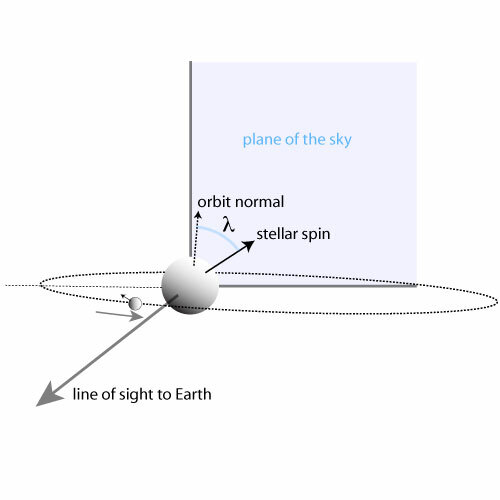 If, however, the planet transits the star we are able to measure the projected spin-orbit misalignment angle, λ, in the plane of the sky. This is called the Rossiter-McLaughlin effect (RM effect). As the planet transits the star small changes in the radial velocity measurment can be observed. 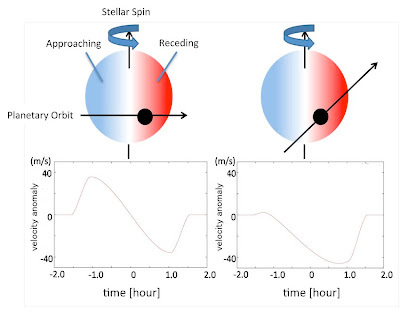 The radial velocity is the shift in the spectral lines of a star induced by another body in the system causing the main star to change in position and velocity as they orbit the center of mass of the system. The video on the left shows how the spectral lines shift over as series of orbits (ESO/L. Calçada http://www.eso.org/public/videos/eso1035g/). 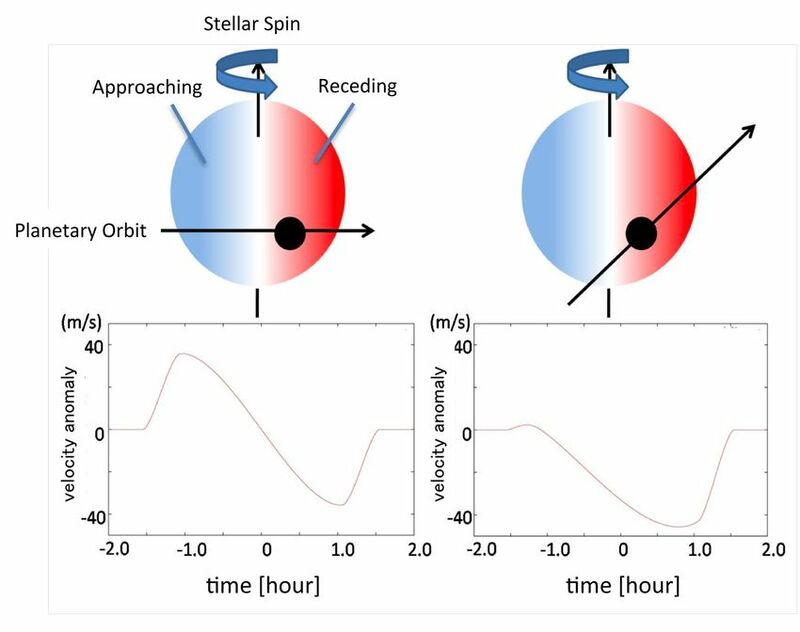 Radial velocity observations can also tell us a lot about the orbit of the planet, as they are highly affected by the spin-orbit alignment of the planet-star system (the RM effect). As the star rotates relative to the observer, us on the Earth, half the light is blue shifted as it rotates towards us, while half is shifted toward the red as it rotates away from us. When the transiting planet blocks the blue-shifted light we will see more of the red-shifted light relative to the blue and vice versa when the planet blocks the red-shifted light. By modelling the RM effect, the angle of the planets orbit relative to the rotation of the star can be calculated. 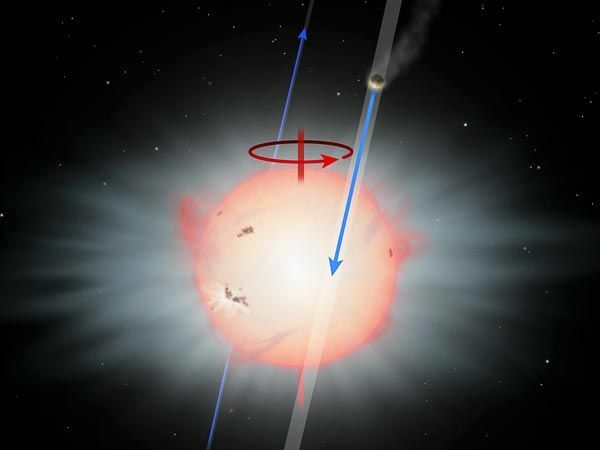 A large number of systems have now been found to be misaligned with their host stars rotation, even to the extent that they rotate in the opposite direction to their star, which has provided a lot of information about exoplanetary system formation. The RM effect: showing the change in the RV at different angles. It is important to remember that a theory can be developed using all currently known physical principles. However, without observations it is still just a theory. It is also very important to note that if observations disprove your theory, in this case planet formation, it is not necessarilly a bad thing!